Who Said Merchants Can’t be Heroes? 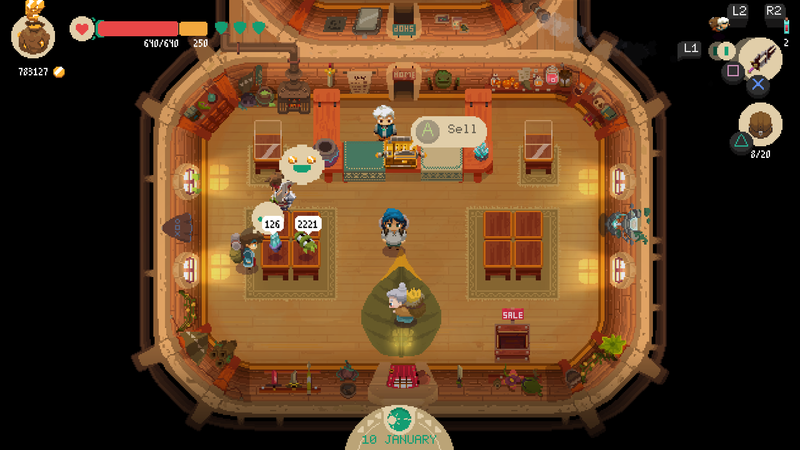 Juggling both action-RPG elements and shop management, Moonlighter offers a lot to keep players’ experiences interesting throughout. Gameplay alternates between rogue-lite exploration of dungeons to progress through the story, and building up a business and town by selling items found therein, acquiring resources to ultimately get stronger. Along the way, players uncover clues about the dungeons’ history and unlock the secrets behind their mysterious and unusual nature. Moonlighter takes place in the town of Rynoka, located near a strange set of dungeons. While adventurers often explored these in the past to find and sell artifacts, the dungeons have long been boarded up for safety reasons. This led to an economic decline in Rynoka. The protagonist, Will, has inherited a shop from his father, but rather than being content with the status quo, he is intent on exploring ever deeper into the dungeons to find increasingly rare and more expensive items to sell. There are five dungeons with three floors each, operating with rogue-lite mechanics. When Will is knocked unconscious, the dungeon teleports him outside, causing him to lose all found items except those in the first row of inventory slots. If Will reenters the dungeon he finds that it has completely reorganized, with new rooms, items, and enemies. Will can also opt to spend gold to leave a dungeon prior to death, allowing him to keep all found items. With yet more gold he can also resume the dungeon from where he left off. What is interesting, though, is that the reshuffling of the dungeons is more than a game mechanic, but also a core part of the narrative. The dungeons’ strange behavior is known to the inhabitants of Rynoka, and the reasons behind what is going on are progressively revealed through item descriptions and notes Will finds from other explorers and people associated with the dungeons. Though the game is light on story, it does a great job of presenting the narrative in a piecemeal sort of way, encouraging players to fill in the missing gaps in the stories of others who have come in contact with the dungeons, and ultimately build the complete picture of what is really going on. It’s an engaging, fun, and original backstory that could have been even better with a few more fleshed out bits and pieces to tie it all together. 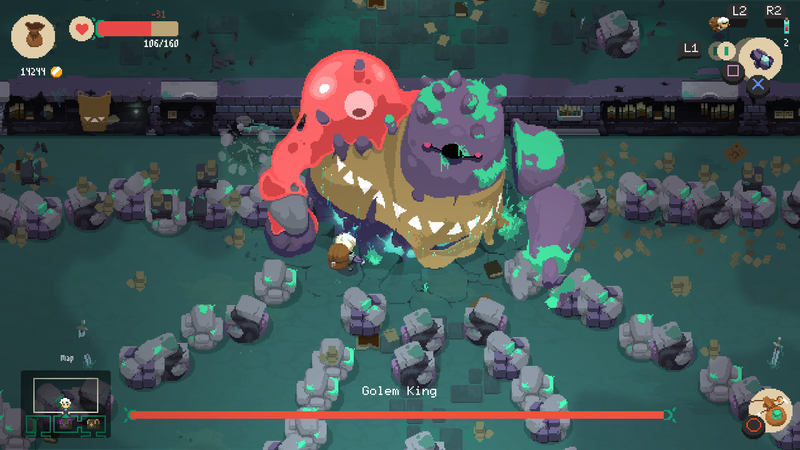 Combat in Moonlighter is a top-down Zelda-esque experience. Players can equip two of several different weapons with different play styles, including a bow, a spear, a heavy sword, and a sword and shield combo. Each weapon offers a different combination of speed, range, and number of consecutive attacks, as well as special moves that can be charged up. Players can also roll to dodge enemies as the main form of mitigating damage, while some weapons like the sword and shield allow players to block as well. Players can choose from three different sets of armor, one focused on speed, another on sturdiness, and yet another balanced in between. When players first enter a new floor they may feel underpowered, but as they collect more powerful artifacts found on the new floor, they can use them in town to upgrade weapons and armor and gain the upper hand. It’s quite satisfying to alternate between weak and powerful states, forced to be extra careful not to make any mistakes when first entering a floor, but then taking pleasure in punishing the enemies when the power levels shift back in the player’s favor. While there isn’t as much depth to combat mechanics as one might like, the responsive and satisfying controls, the variety of well-designed enemies, the cyclical nature of the difficulty, and the handful of play style options available make for a very enjoyable overall experience. While Will explores dungeons for artifacts, he must choose which ones he wants keep. 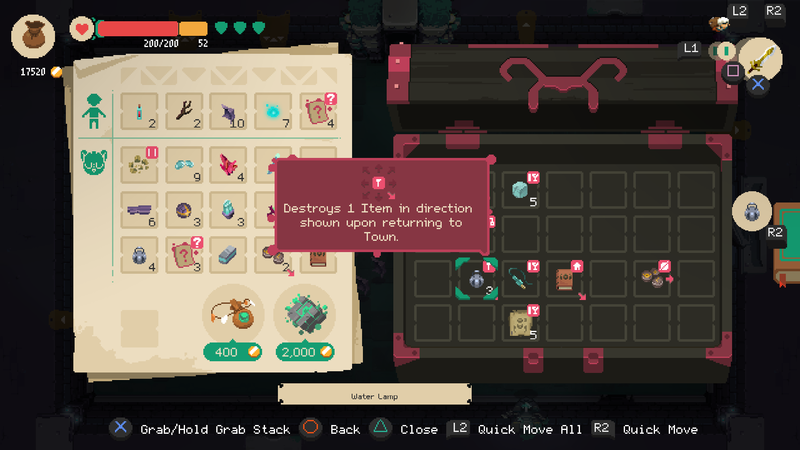 The combination of limited inventory space and special requirements on how to place many items has players engaging an inventory management mini-game, with the end goal being to carry the most valuable set of items. When Will returns from the dungeons he can sell the items he’s found in his shop, which are hopefully the most valuable of the bunch. In many ways, managing and selling items serves as the game’s leveling system and is much more engaging than grinding experience by killing enemies. Players must choose which items to place on the counters, and set appropriate prices. Pricing items too high leads to unhappy customers and slow sales, while pricing them too low will lead to bringing in a low amount of revenue, which translates to suboptimal speed of progression. Icons that pop up over customers’ heads show their feelings and give Will hints as to how close the prices are to optimal. Like combat mechanics, the mechanics for the management system are also generally simple, but the enjoyment comes from slowly working through the long list of new items to figure out which of them are actually valuable and worth carrying in the limited inventory, especially in the top row that is retained upon death. Once players figure out the valuable items for a given dungeon and can stop fiddling with prices, there’s a definite sense of accomplishment watching the nearly automatic and continuous stream of high-value sales that begin to pour in. The system works great as a break from dungeon crawling, as an alternative to experience-based progression, and to make visits to Rynoka more than simple supply runs. Will can use the money earned from the shop in numerous ways, including to upgrade and buff weapons and armor, as well as to improve Rynoka by adding new shops and functions. The process of entering a new floor, collecting more powerful artifacts of exponentially increasing worth, and selling or using those in town to unlock the next set of upgrades is the repeating cycle by which the game unfolds. It succeeds in creating a fulfilling sense of consistent progress that depends equally on adventuring and shopkeeping, rewarding players for their efforts in both. 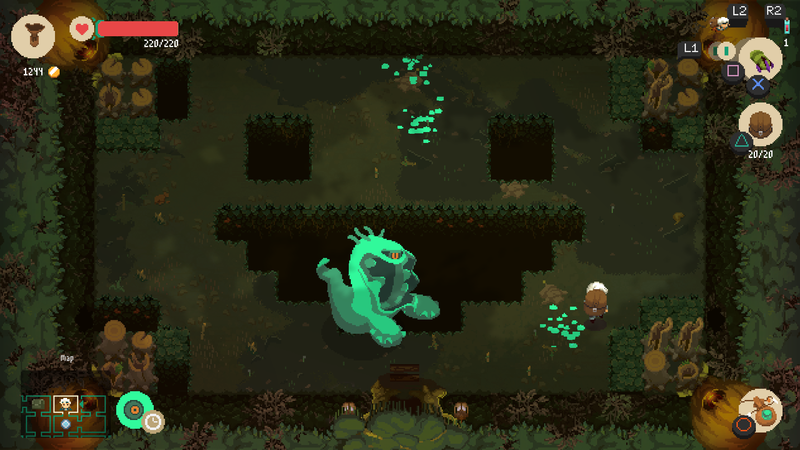 Moonlighter also features some of the best pixel art I’ve seen to date, with vivid, detailed designs and great lighting effects. The pixels engage in a fluid dance during animations, and the variety of environment designs in each of the themed dungeons are all top-notch. The developers haven’t skimped on enemy and NPC designs either, with some great boss designs and a variety of enemies in each new area. The game also boasts a soundtrack with strong melodies that stand out and numerous memorable tracks. Many of the tracks are, unfortunately, variations of others, and all tracks are generally in the same style. Despite tracks being consistently enjoyable, this leads to a notable lack in variety.